Monday’s historic meeting between U.S. President Donald Trump and Russian President Vladimir Putin was newsworthy for all sorts of reasons, the vast majority of which have absolutely nothing to do with sports. However, there was one brief moment that caused a blip on our radar. 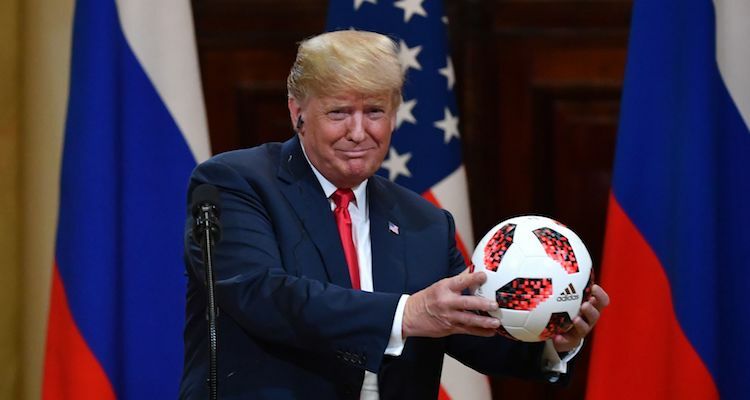 During the press conference following their one-on-one meeting, Putin gave Trump an official ball from the recently completed 2018 FIFA World Cup. As he handed it to him, Putin told Trump, in Russian, that the ball is in his court. Trump then said he would give the ball to his son, Baron, and tossed it to his wife, Melania. Given the fraught political climate in which the meeting between Trump and Putin took place—i.e., the allegations of Russian meddling in the 2016 Presidential Election and Trump’s apparent eagerness to ingratiate himself with Putin—Twitter had all sorts of jokes about Putin giving Trump the ball. And they pretty much all fell into two categories. Some unsolicited advice for President Trump: Microwave that soccer ball before you give it to your son. Putin just gave Trump a ball, which means he’s only keeping one of the President’s testicles. All politics aside, who doesn’t love a good balls joke?